Sorry, we're having a "break" and won't be renting our Airstreams in 2018. Is it big enough?!! 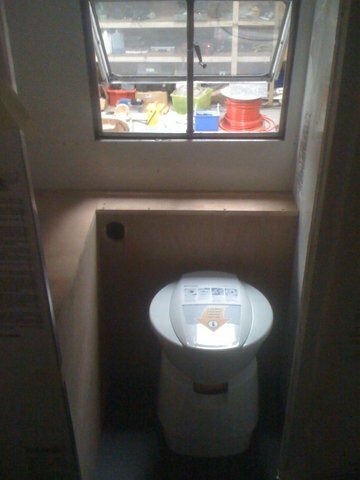 I guess only time will tell, but our ‘compact’ bathroom is now in place, awaiting counter top, sink and some laminate over the plywood to make it nice and pretty. Oh yes, and a heated towel rail – mustn’t forget about that. Our biggest challenge with the bathroom (yes, I am going to call it that, it’s NOT a ‘cloakroom’) was making it large enough so that it would work (i.e. without the need to have your legs poking out of the door when sitting down – not very user-friendly), whilst at the same time allowing as much space as possible for the wardrobe alongside it. We’re yet to use the toilet “in anger”, but on the face of it, seems like we’ve got that right. Because of the somewhat limited space though, we were very restricted in terms of choice of wash basins, as we really didn’t want to have to go for one of those silly little cloakroom basins that you can just about wash your hands in, but very little else. We quite liked the current trend for a round “wash bowl”, as they always seem to look stylish when you see them in other Airstreams, but with only about 350mm to play with, the vast majority of those that we looked at were just too big. We have however always liked Duravit bathroom fixtures though, so rather hoped we would be able to find one of their low rectangular basins that would fit, as that would look pretty cool. Sadly though, that wasn’t to be, as even their narrowest wash basin was 50mm deeper than the top it was going to sit on, so it was beginning to look like we would need to go down the route of the small cloakroom type basin. Until, that was, we discovered ClickBasin (heck, let’s give them a link www.clickbasin.co.uk) who had an amazing selection of basins, including 4 proper sized ones that would fit, together with about 10 cloakroom ones that I hate to admit, didn’t look all that bad! 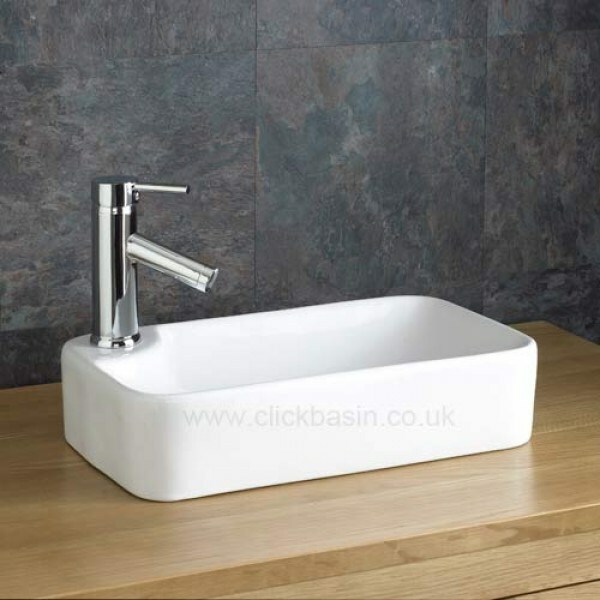 Torre Wash Basin from ClickBasin – 441mm x 257mm – Perfect Fit! After much agonising as to ‘with-tap-hole’ / ‘without tap hole’, we settled upon the Torre model with the integrated tap hole, as having an external tap would mean taking up valuable space on the counter top. Won’t be quite like the photo – it will sit on a charcoal Corian top, with a full size mirror behind to hopefully increase the sense of ‘space’ in what is a compact little room. Next PostNext New arrival – 1955 Airstream Whaletail Cruiser! Airstream Safari Seating Now Done!